On the morning of May 6th, Gwyndolyn’s nest was empty. 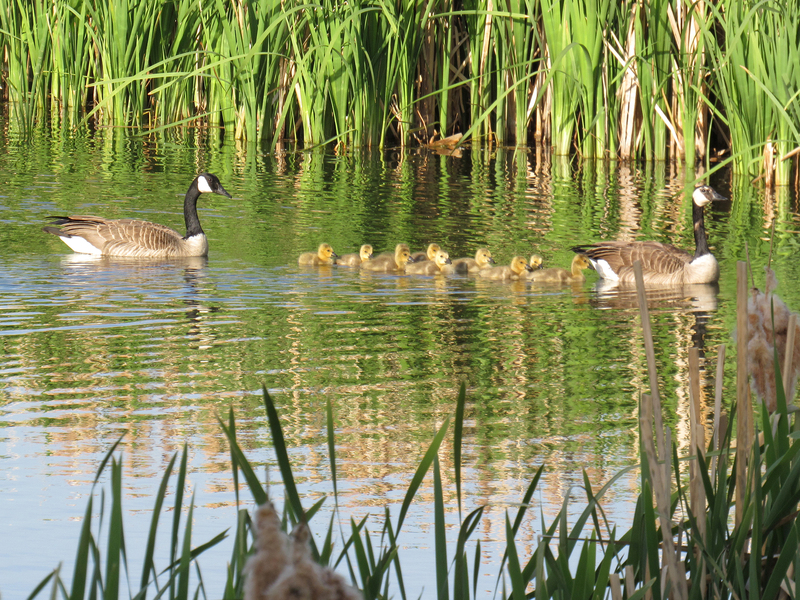 The whole family was swimming across the south pond in an approximate line, with mom in the lead. I can only count 7 fluff-balls in the photo, but there were 8. Their destination was the tasty and rarely human-disturbed grassy strip that forms the central portion of the peninsula which separates the north from the south pond. I didn’t visit the pond again until a week later. On May 13th, Gwyndolyn’s family was munching on the southeastern short grass. 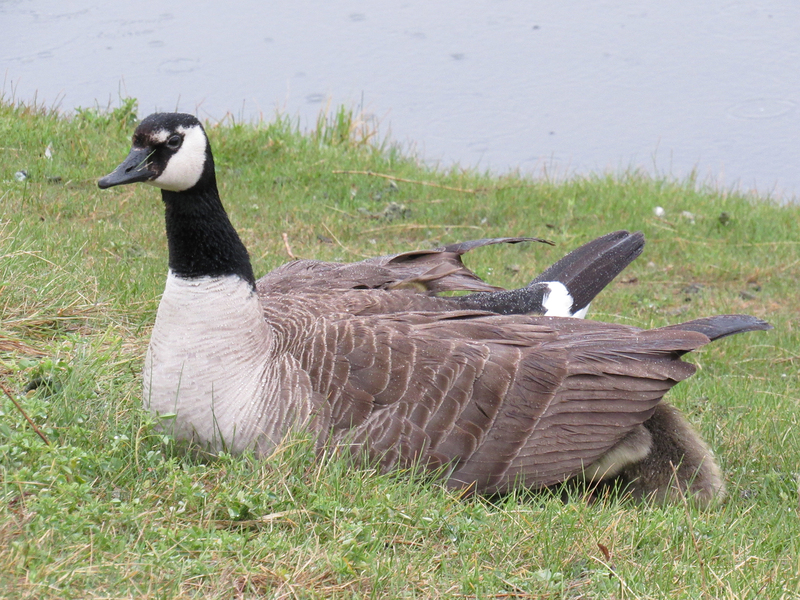 And another family of Canada geese (left side of photo) was grazing in the same area! 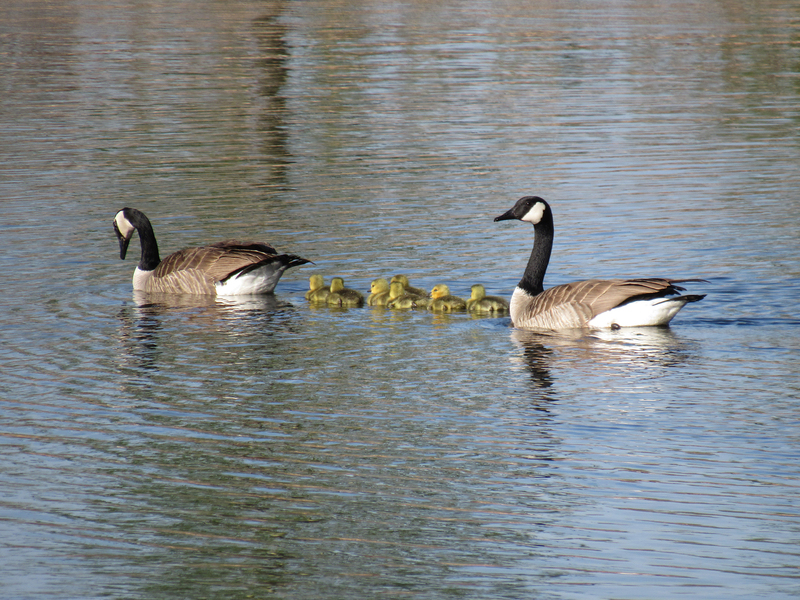 The pond’s Canada goose population had now increased to two families and it would stay that way until all the geese left in late July or early August. I wonder where the second family walked from? 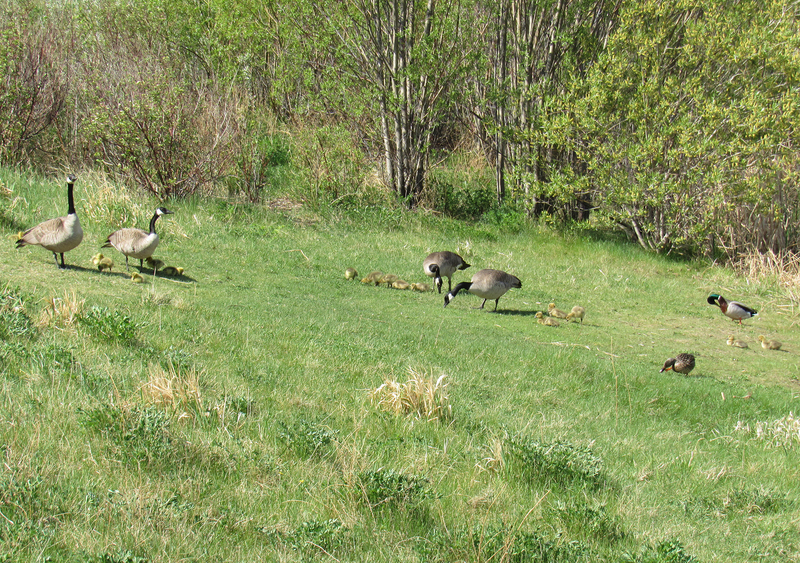 It isn’t super evident from this photo, but Gwyn and George now have 10 goslings while the new family has 6. This becomes clear when the two families are in separate locations. I wonder if 2 of Gertie’s wee ones joined Gwyn’s pack? 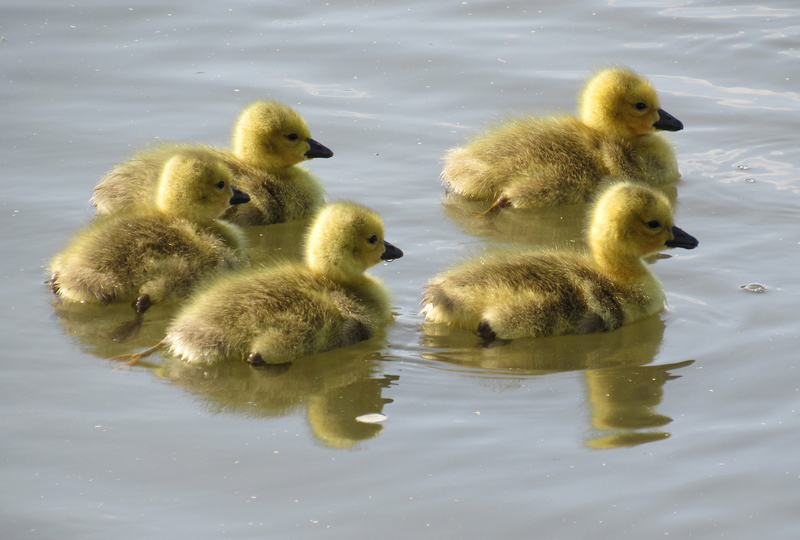 Jennifer Landin at Red Newt Gallery wrote about young goslings associating with non-siblings (she also drew a super-cute drawing of a gosling with carbon dust). 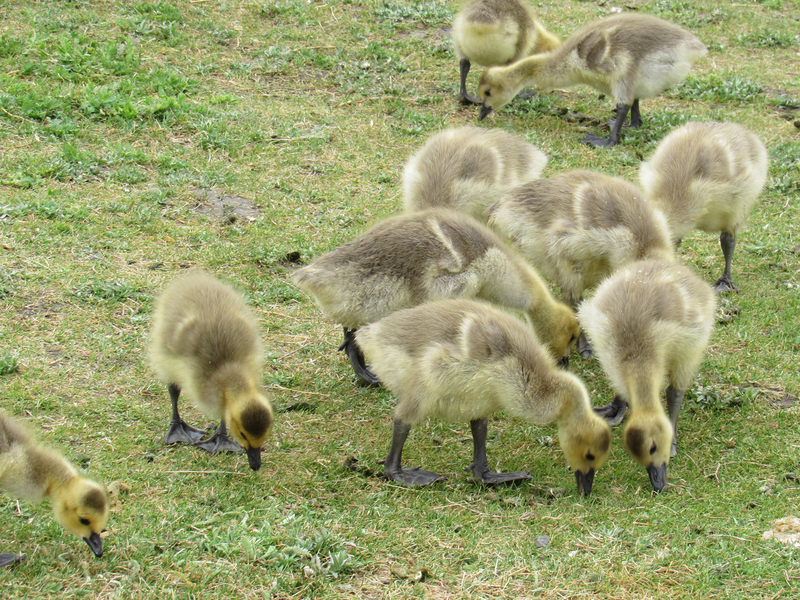 Gertie’s goslings were smaller than Gwyn’s, but two of Gwyn’s were smaller than the other 8. Like Gwyndolyn, Mama Gertie, had a distinctive marking: a small black spot on her cheek. The spot is easy to see in this family photo from May 14th. 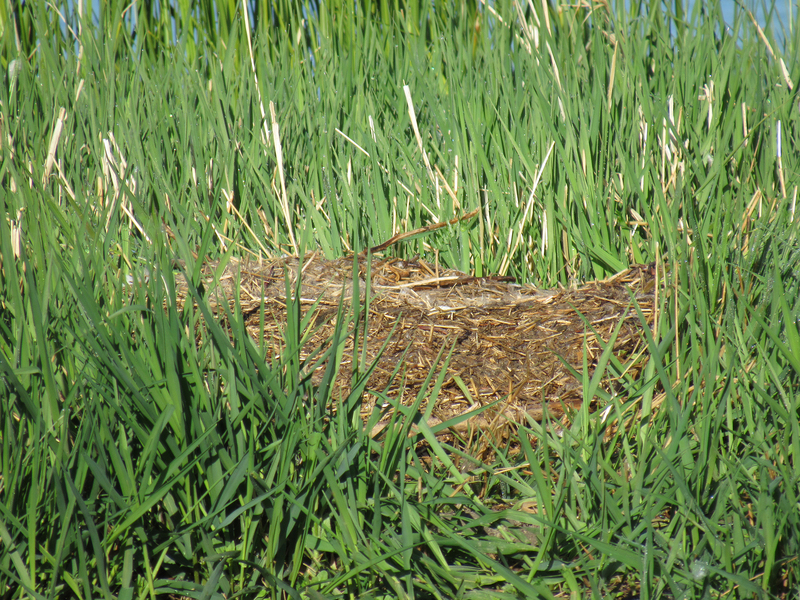 On May 22nd, I found the Gwyns feasting on northcentral grass. The water ripples of Mrs. C.G. (Common Goldeneye) and some of her little ones are visible in the background of the photo below. Unlike George, Mrs. C.G.’s mate wasn’t into co-parenting. Some photos of the C.G. family on that day are in an earlier blog post. I think the “main gosling” in the photo below looks a bit older than the one in the following photo. 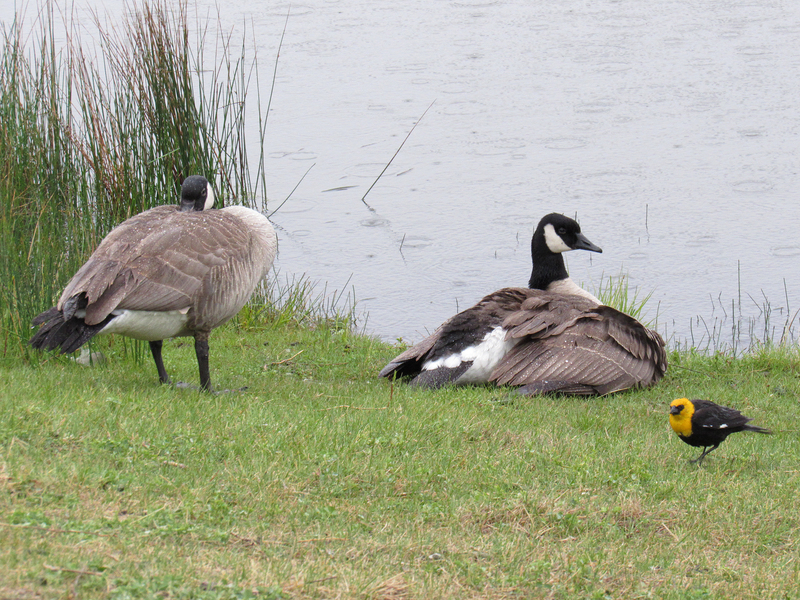 Maybe the younger one is one of the two goslings that traded Gertie for Gwyn? The May 21-23 long weekend of 2016 was very cold for May. It snowed all day on May 21st and was still snowing on the morning of May 22nd. The morning of May 23rd was cold too, but a bit above freezing and there was a light drizzle. When I arrived at the pond shortly after 6 am, both Gwyn and Gertie had their goslings under their wings. 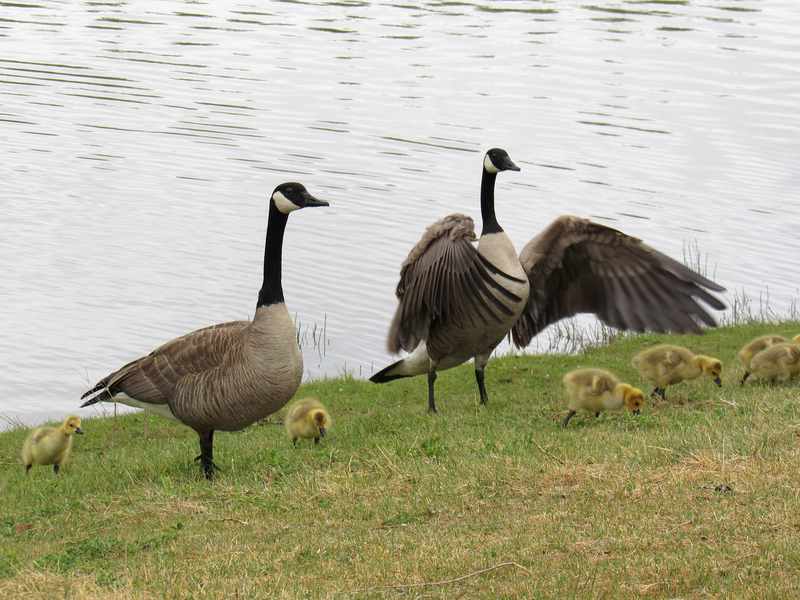 Gertie’s 6 goslings were fully covered, but a few gosling butts were poking out from the rear of Gwyn’s wings. 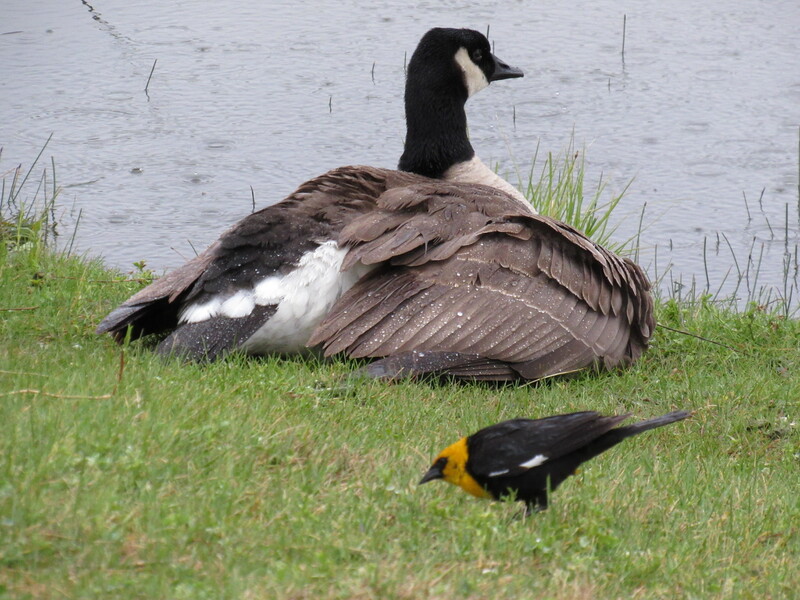 A Yellow-headed Blackbird showed up at the pond on that weekend. He stayed for about a month, along with 2 or 3 other males. I wish he and his look-alikes had found mates and stayed longer. Their harsh, loud songs, that were reminiscent of metallic car horns, added some fun variety to the pond’s soundscape. The first YHBB is near the Gerties below. 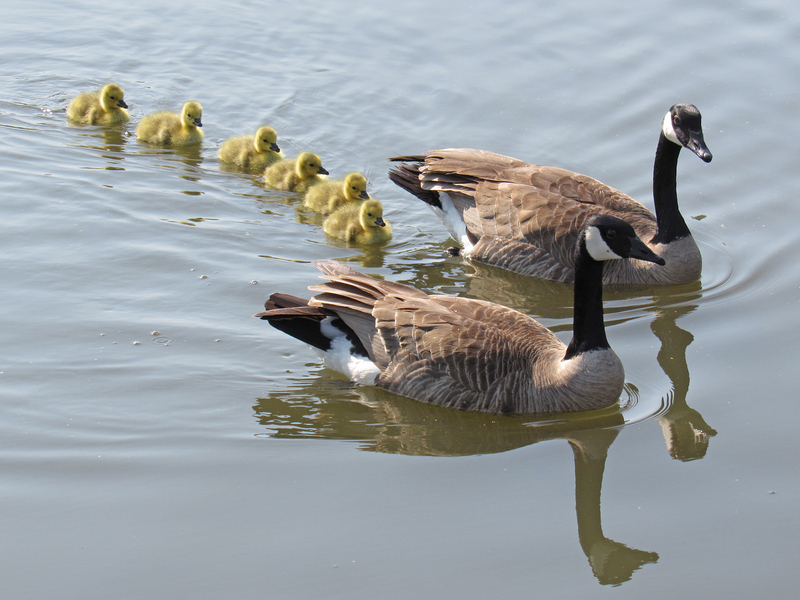 Canada goose moms brood their young at night and in inclement weather for about a week after they hatch, and occasionally, older goslings will huddle under their mother’s wings (Birds of North America). In June and July, I only took a few sporadic photos of the young geese as they grew to their adult size and acquired their flight feathers. I’ll leave these for Part 4. For photos of Gwyndolyn sitting on her eggs, see Part 1. 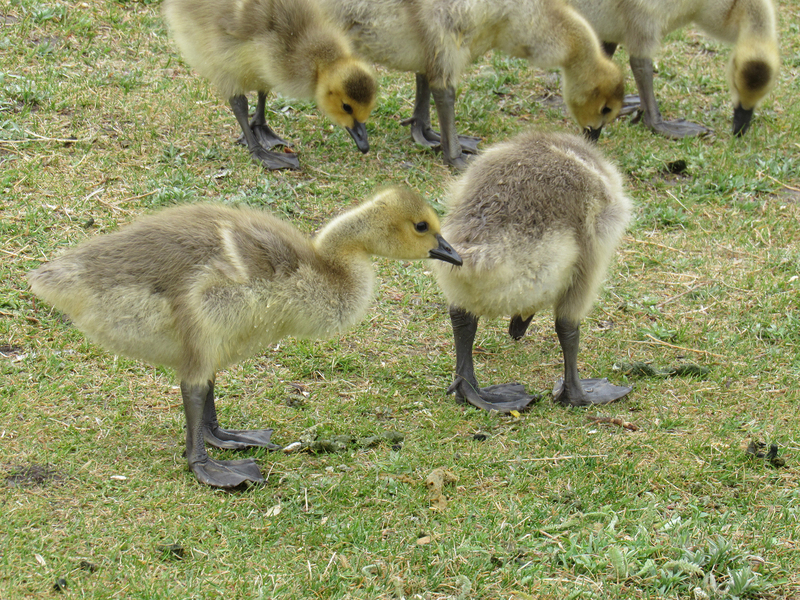 See Part 2 for photos of the newly hatched goslings. 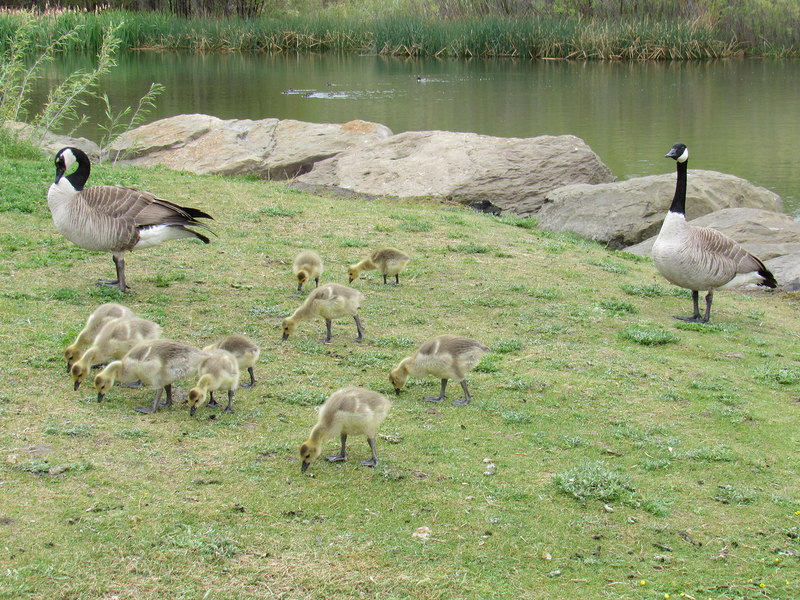 Glad you liked the goslings :-). They were a pleasure to observe. What an evolution! 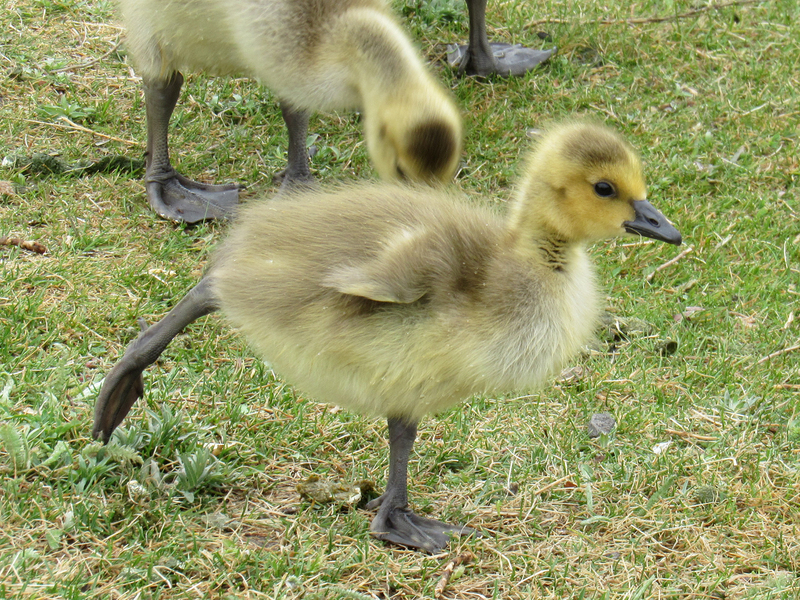 When I read one little gosling was missing my heart ached and my eyes teared up. Nature is so cruel!! I cheered up when I read there was a trade! Perhaps the other mama goose had too many to care for and she knew she couldn’t cope, and she knew Gertrude had lost one to a predator and needed her whole brood. I’d like to think so! I so admire your dedication to see this through!!! WOW. WOW! It’s an amazing story; one I loved! I’m looking forward to Part 4! Oh you’re all settled already! I hope you guys are happy there. Superbe reportage photos, c’est super de voir grandir ces adorables boules de duvet 🙂 Le coup des poussins bien au chaud sous les ailes de Gwyn et Gertie, adorable !